Helmets, shoulder pads, and shin guards: if you’re an athlete or have children who are, then you know the importance of protective gear. But did you know that up to 40% of all dental injuries are sports-related? Protect your or your child’s mouth and smile with a custom-fitted athletic mouth guard. Designed to fit snuggly with the contours of your mouth, an athletic mouth guard crafted by a professional will drastically reduce the risk of a sports-related injury to your lips, tongue, face, and jaw. New research shows that an athletic mouth guard may even reduce the severity of a concussion. Dentists and the American Dental Association strongly recommend athletic mouth guards for anyone participating in a recreational activity that could potentially involve an injury to the mouth. The number one complaint from athletes concerning mouth guards is that they impair speech and breathing. This isn’t the case with a custom-designed athletic mouth guard. Dr. Smith or Dr. Yap will take precise impressions of your mouth, and a skilled technician will handcraft the mouth guard according to the specifications. When your mouth guard arrives, the dentist will make any necessary adjustments, ensuring a comfortable fit. 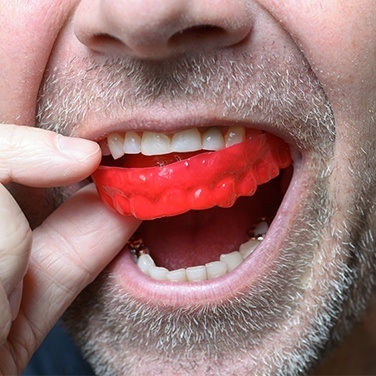 Special mouth guards can be made to accommodate patients with braces, dentures, a protruding jaw, or a cleft palate.